Official! Floyd Mayweather vs Manny Pacquiao set for Boxing super fight on May 2nd in Vegas | MMACanada.net - Canada's number one MMA website - UFC, Strikeforce, MFC and more. It is finally official. The most anticipated Boxing fight in decades will finally go down in May. TMZ Sports first reported that undefeated boxing legend Floyd Mayweather will settle the score against longtime rival Manny Pacquiao on May 2nd in Las Vegas, Nevada. While there are only little details, it finally seems boxing fans will see the fight they have dreamed about for years. The fight has lost a bit of hype since Pacquiao was knocked out by Juan Manuel Márquez, however he was able to win three fights in a row in impressive fashion, setting up the mega showdown with “Money” Mayweather. 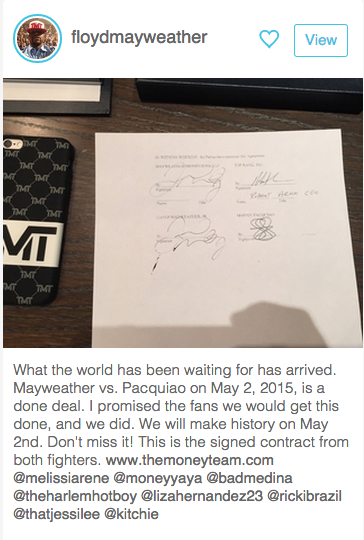 It will be interesting to see if Pac Man can give Money Mayweather his first defeat in the ring!